It was my daughter who was anxious that she should hear more about the air-raid shelter tragedy in September 1940, as over the years I have never been able to speak to her about it. About 8 years ago I decided to write down my memories of this unfortunate event and, prompted by an East-End friend of mine; I did so and found that by doing this it helped me to come to terms with the incident. It was then that I also started to give talks to pensioner clubs, old peoples homes and schools. One of these talks was while my grand-daughter was there in the school. Most of the school talks were about evacuation and I deliberately left out the more horrific times that I had. However, like yourself, I think that this incident is very much part of the history of Tottenham and should be recorded. So anyway I decided that if I can help then I will do so. In 1940 the Blitz started and consequently it was decided that we as a family would go to the Public Shelter in Lordship Recreation Ground. It had only been opened that day or the day before by the Mayor and there was a band playing at the opening ceremony (this was a fact that I found recorded in a book so I have enclosed the page its copied from for your files). My mother said it was a safe shelter as it had so many yards of concrete etc and was supposed to be very safe and strong. So my mother Honore, my sister Rosemary, grandmother Elizabeth (Finbow) and myself (Lilian) went along to the shelter. My father, Robert Porter, was fire-watching and my grandfather, George Finbow, said Hitler wont get me in a shelter. How right he was ! For that was the night that the bomb fell. This now is my memory of that fateful night, and I was reminded of this when I went to the Imperial War Museum with my daughter recently, when strangely I re-lived it all over again. Near us there was and still is a big park, half of which in those days was allotments. It was decided by the council to do away with these and construct a huge shelter, as we were such a thickly populated area. On the day the shelter was opened, I think by the Mayor, it was a field day with a band and happy atmosphere and everyone rejoicing. It was either the day or night after, the shelter got a direct hit. They didnt even bother to dig them out, there were so many. We had a letter from the council asking us to watch for empty houses and if we hadnt seen the usual people around. This was the only way they knew who was down there. As this was the first time we had been in a Public Shelter I was quite excited. Everyone seemed in a jolly mood and someone was playing a mouth organ and, as I recall, I think we were all singing to it. But little did we know what was in store for us, as that night we had a direct hit and were bombed. I was told that the bomb landed between a ventilator shaft and the exit, so we must have been trapped as the bomb there must have been a delayed action before the explosion. There was a man who was leading us in singing and my Nan said to my Mum You take Rosemary and Ill take Lilian and well find a way out of here. These were her last words ! We were buried under the shelter rubble and had to be dug out. My mother remembered being dragged out and having a leg wound (shrapnel I think) and then seeing the searchlights overhead. We were all taken to different hospitals as there were so many casualties. My Mum was taken to St Annes, although at that time this was called the North-Eastern Hospital, and my sister and I went to the Prince of Wales Hospital. Then, for some unknown reason, I was taken all the way to Chase Farm Hospital in Enfield. It must have been awful for my Mum when she was finally able to find us, but a great relief to find us both alive. My Dad was amongst those who dug in the search for people alive or dead. As there had been no roll-call, people were asked to look out for neighbours and report any missing persons to the authorities. Ray, I wont tell you about our injuries as they seemed bad but I think that we were just lucky to be alive. From the many notes about the shelter tragedy that you have sent, lots of the details were most important to me, and also to my husband. He will be writing to you with regards to his experiences of Tottenham life. If possible I would like to get in touch with Vera Firth in Downham Market, who was born in January 1931 as I was born in March 1932 and maybe we can talk. I would also like to speak with Fay Barbara Grant (née Simmons) who was born in February 1936 as my sister was born in October 1936. Hopefully these people are still around but if I could be put in touch with anyone else who survived that shelter that would be great, so please pass on my details if anyone else is interested. Once again many thanks for all the information that you kindly sent to me and anytime that you want to write or phone then please do so. I have so many other memories of Tottenham that I can recall, so maybe in some way I can also help you. May you carry on with all your local history research and any more information that you find, would you please send it to me. I shall send copies of the information to my sister, Rosemary, who now lives in Australia as she is also interested. Its been so nice to talk about the incident after all of these years and Ive found that by talking it helps me and maybe others. I had always thought that I was the only person with memories of the shelter tragedy and its been so comforting to discover that there are several other survivors with whom to share our experiences. Many thanks for all of your hard work. Editors Note: Lilians Grandmother Elizabeth Finbow, was sadly killed in the shelter and was living in Dunloe Avenue at the time. Lilian and her family were living in Clyde Road. 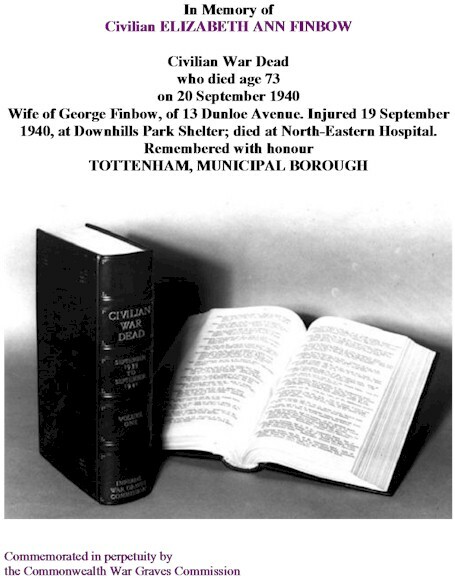 Please refer to the following extract from the official register that recorded her death. The informant was her son-in-law, Robert Porter, Lilians father. Regrettably the image quality is very feint.